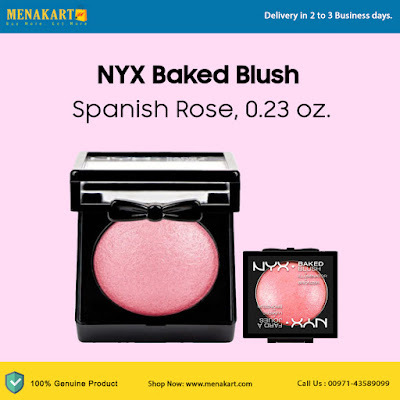 NYX Baked Blush - Spanish Rose, 0.23 oz. Baked to sheer perfection this luxurious formula is packed full of pigments to provide a natural glow and highlight to the face. Uniquely designed to be used wet or dry depending upon the makeup statement you want to make. When used dry with a brush the look is light and fresh. Ingredients: Talc, Ethylhexyl Palmitate, Magnesium Aluminum Silicate, Silica, Polysorbate 20, Dimethicone, Methylparaben, Diazolidinyl Urea, Propylparaben. May Contain / Peut Contenir (+/-): Mica, Titanium Dioxide (Ci 77891), Red 7 Lake (Ci 15850), Iron Oxides (Ci 77491, 77492, 77499). Ladylike Talc, Ethylhexyl Palmitate, Polyethylene Terephthalate, Silica, Magnesium Aluminum Silicate, Polysorbate 20, Dimethicone, Methylparaben, Diazolidinyl Urea, Propylparaben. May Contain / Peut Contenir (+/-): Mica, Titanium Dioxide (Ci 77891), Red 7 Lake (Ci 15850), Iron Oxides (Ci 77492). How to Use: Apply wet with a makeup sponge for more intensity.